Ryan and I met up with Jason, Scott and Troy after hours down at the RB fabrication shop in NE Minneapolis. Only Brady was missing from our full tour of their four-man facility, which struck me as much more of an artisan space than a factory. The passage way walls were lined with slabs and scraps of construction and countertop material both familiar and exotic. 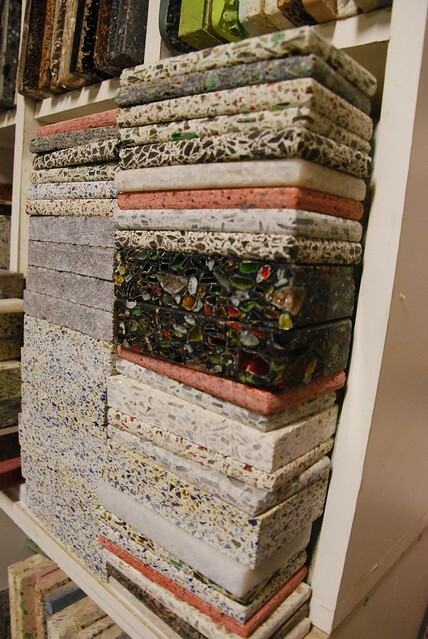 Everything from MDF, to solid oak, to engineered stone, to exotic countertop materials made of everything from recycled paper to colorful chunk glass. Various jigs and forms were stowed in amongst the raw materials as evidence of projects past and in-progress. It’s dirty work, all of it, but I was actually surprised how clean the shop was. It’s hardly clinical, but that’s a good thing. Real work is going on within these walls, done by people who really care about what they’re doing. There’s something really compelling about a space that’s both humble and capable. It’s easy to throw money at a facility and overload it with fancy equipment. It’s another thing entirely to create one-of-a-kind, world class interior materials by hand in just a few thousand square feet. We toured the cabinet fab shop as well as the space where they polish, cut and fit their countertop slabs after they’ve been formed. Then we got to see the incubator, if you will. 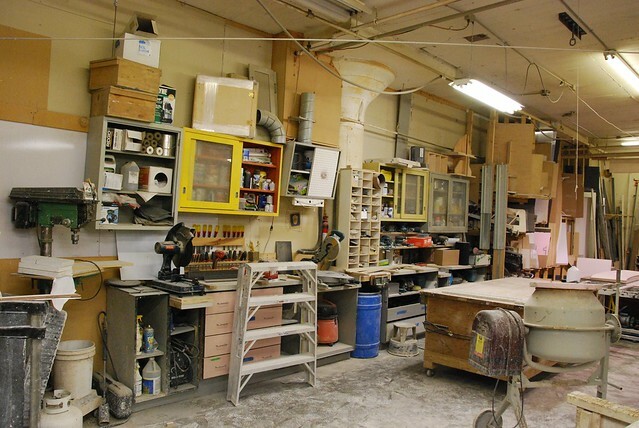 In the back end of their facility, in a room that also doubles as their office space, they had a countertop slab in the process of being formed. 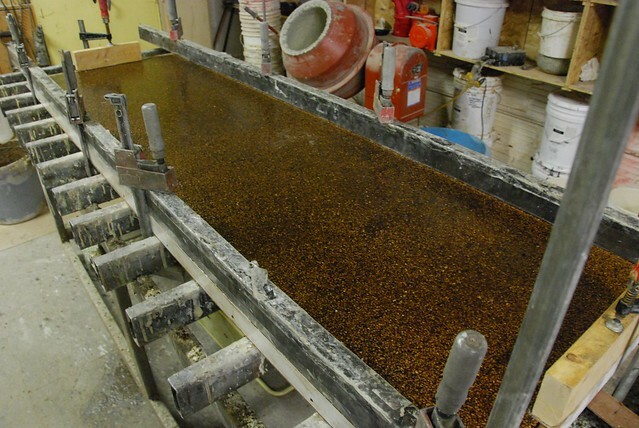 Though each of The Rust Brothers’ exotic countertop materials has its own recipe and fabrication process, the underlying principles are usually something to do with an interesting aggregate, a binding agent, heat and sometimes pressure. Where things get interesting is in what kinds of aggregates they use. Everything from big, chunky, colorful pieces of glass, to quartz with pigment added, to recycled broken auto window glass. 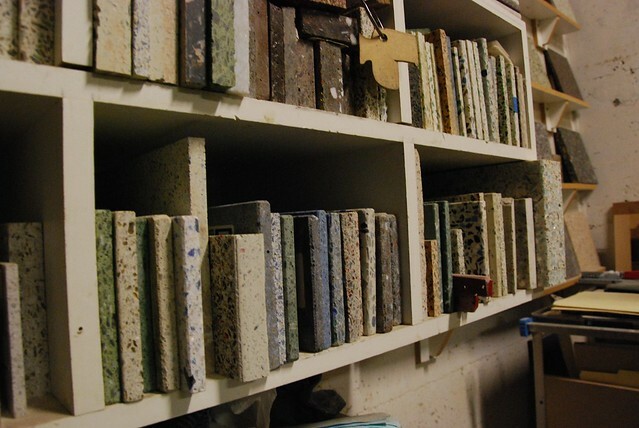 Almost anything hard and interesting can be made to work in a countertop. Best of all, it’s mostly materials that would otherwise just go to waste. This in contrast to expensive, often wasteful materials like soft marble or porous granite that have to not only be quarried, but often shipped across the country, if not around the world. Even your big-box store quartz materials have to be shipped in from Europe. There’s definitely something both ingenious and romantic about making something beautiful, durable and high-quality out of stuff that other people have quite literally thrown away. The back wall of their office was stacked floor-to-ceiling with beautiful material samples. 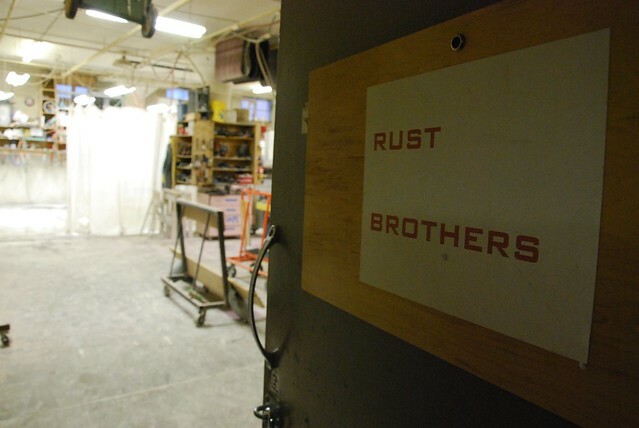 As we talked about their business and about the myriad of materials at their disposal, what was most obvious about Jason, Scott and Troy was their passion for what they do. These aren’t just guys with tools churning out the same old stuff. These are craftsman who care about what they do and have made a commitment to not only do it well, but to do it with style — to not just do the same old thing. They’re good people that do good work. They’re also motorcyclists, which definitely puts them on our A list. In fact, we’re currently turning Jason’s Honda CB750 into a Freddy Spencer tribute bike, but that’s another story.